I posted a comment on a letter, Blatant racism is unconscionable for Harford County Public Schools, that appeared in the Aegis on Oct 20, 2017. I appreciate your concerns and would like to share your hopes. As a society, we need a much greater awareness and willingness to confront the problem head-on. The extent of segregation, discrimination and doublespeak is getting worse and requires a forceful, unified challenge. We need to observe very closely which of our public officials acknowledges the seriousness of this issue and which dismiss and laugh about it. We have seen both kinds following this and other incidents in Bel Air and Harford County. We need to keep the light shining, and support one another in working for change. Written by a grandmother who persuaded her daughter to move to Bel Air, and is now ashamed of the recent racist incident that took place at the high school, the letter made me think about the book we discussed last night at our book club, The New Jim Crow. How naive so many of us have been and how urgently we have to get out of that if we hope to change things rather than talk about how we hope to change things and find two generations later that things are worse than when we started. A new librarian smiled from behind the children’s desk. New to me – she had been working there for some time. Maybe because they rearranged the children’s section or maybe because my daughter was now a volunteer, I no longer found myself approaching the children’s desk with her in tow, and had not properly met some of the newer librarians. Little did I know that it was I, not my daughter, who would receive invaluable help from her. Amy Chmielewski was sworn in as Town Commissioner today. We look forward to working with her on the various issues Bel Air faces. The results are in! Congratulations to Patrick Richards and Amy Chmielewski. We look forward to working with you and setting strong expectations for improving life in our community. Dear daughter, who has attended and spoken at several Town Hall meetings, took the initiative to write to the candidates running in the 2017 election for Town Commissioner. Protesters against the natural gas drilling process known as fracking gather in front of the Bel Air Town Hall Dec. 5. They wanted the town commissioners to pass a resolution supporting a statewide ban on fracking. Harford County opponents of hydraulic fracturing, or fracking, to capture natural gas and shale petroleum deposits picked what at first appeared to be a curious venue to go public with their concerns: A meeting of the Bel Air Board of Town Commissioners. Bel Air Town Council hears people call for a resolution supporting a Maryland ban on fracking … but do they listen? 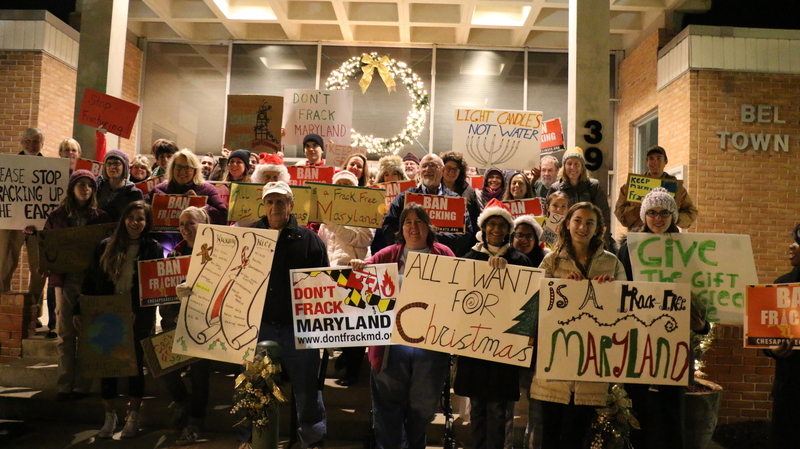 Concerned townsfolk and friends from around the county and neighboring Cecil and Baltimore counties rallied outside the Town Hall in Bel Air and called for a statewide ban on fracking in Maryland. After some rousing Christmas carols, the group heard from Tracey Waite, President of Harford County Climate Action, Brooke Harper of Chesapeake Climate Action Network and Steve Mogge of Citizen Shale in Garrett County which would be one of the first to be affected if the Maryland moratorium on fracking was allowed to expire without a ban to replace it. Rally to Ban Fracking, Bel Air Town Hall.